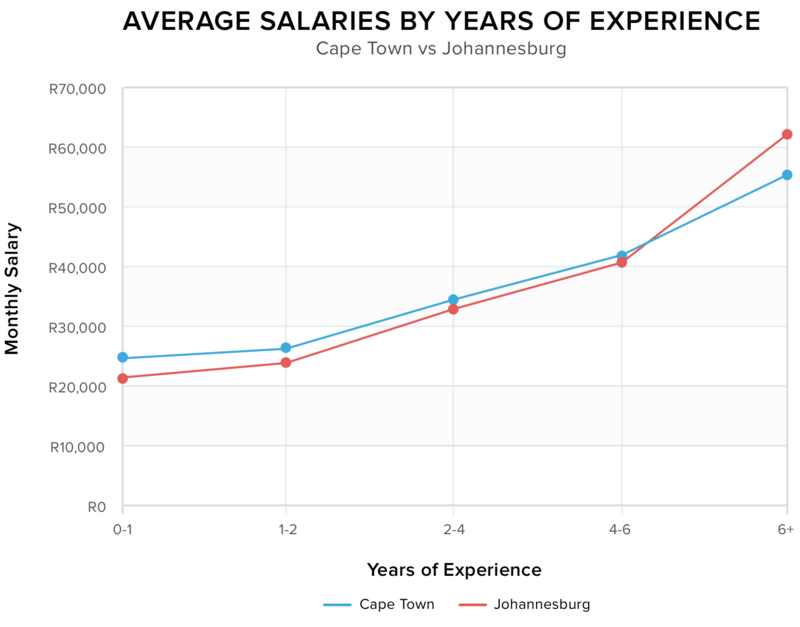 A year ago, we wrote our first salary article comparing the differences in developer salaries between Johannesburg and Cape Town. Since then, OfferZen has grown by 400%, hundreds of developers have found jobs through us and our presence in Johannesburg has grown. That’s why we decided to compare the two cities again, this time with a much larger data set. While Johannesburg’s graduates earn around R22k at their first jobs, Cape Town’s entry level salaries are on average 14% higher. It’s worth noting that OfferZen is a curated marketplace, so our averages are probably a bit higher than the national average for developer graduates. A reason for discrepancy between Johannesburg and Cape Town is likely the fierce competition for UCT computer science graduates. Cape Town has a few international tech companies, like Amazon, who pay a premium for junior developers. Salaries increase with experience at roughly the same rate for both cities all the way to the 4-6 year mark. That’s when Johannesburg takes the lead. 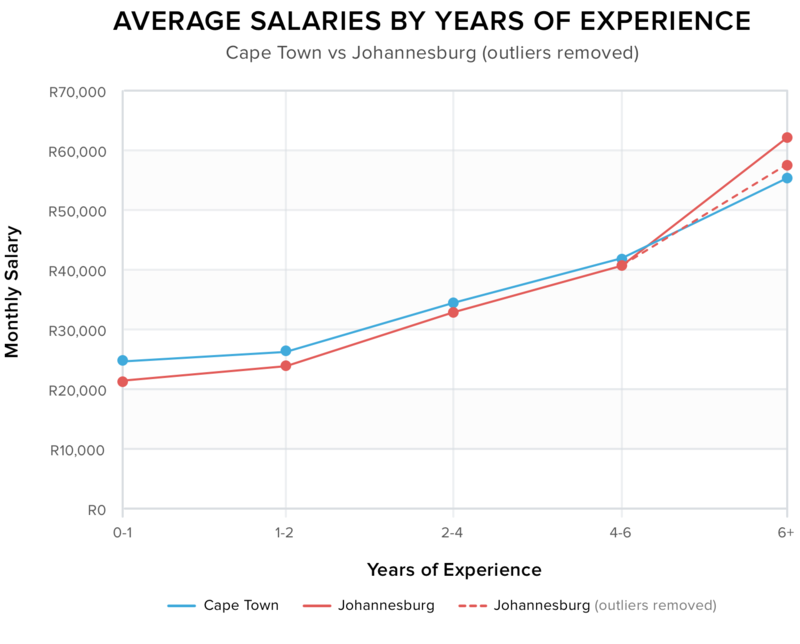 The average salary for developers in Johannesburg with 6+ years experience is R61,240, while Cape Town developers with the same experience earn an average of R54,750. We suspect that this sizeable difference is created by the greater number of large financial institutions in Johannesburg. These tend to pay senior developers more than smaller companies are able to afford. We decided to investigate a bit further and see what the data would like if we excluded the handful of developers who earn salaries above R100k. The reason we did this is that 6+ years encapsulates a few diverging career paths such as architects and tech leads, who often earn higher salaries than developers. So by removing the outliers, it gives us a better picture of what a developer is likely to be earning. As you can see in the graph, the gap closes significantly but senior developers in Johannesburg still earn 5.5% more than experienced developers in Cape Town. At first glance, the Mother City seems to be the most lucrative location for the early years of a career in development. That, however, doesn’t take the difference in cost of living between the two cities into account. Our cost of living adjustments take into account rental, grocery, restaurant and consumer prices and clearly show that it’s more expensive living in Cape Town. 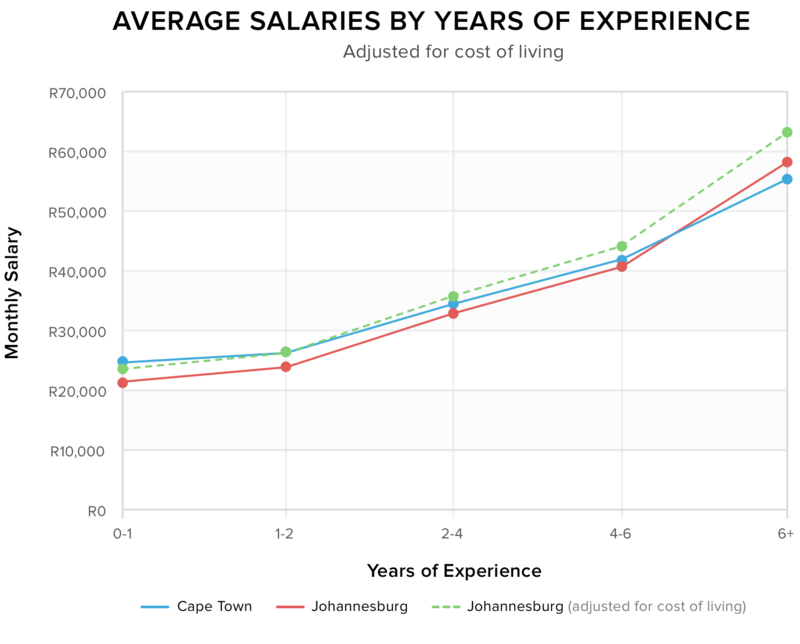 So for a concrete example, developers with 4-6 years of work experience in Johannesburg earn an average of R40,500 but this is equivalent to making R44,100 in Cape Town when you consider the cost of living difference between the two cities. Using a combination of external and internal data sources, we estimate that there are more than 10,000 developers in Cape Town, almost 30,000 in Johannesburg and another 10,000 spread throughout the rest of SA. Despite the fact that Cape Town receives a lot more media attention than Johannesburg and is known as the Silicon Cape for the high number of startups present, there are still way more developers in Johannesburg. This, again is likely due to the concentration of large, corporate companies. Leave a comment below if you have any questions or suggestions for a future analysis. 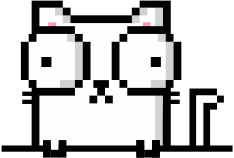 If you’re in the market for a developer, UX, data science or product management job, check out OfferZen to get offers from over 700 of South Africa’s top tech companies. FOOTNOTE: This analysis should serve as a guideline only. Any single individual’s salary will be dependent on the company, individual, perks and nature of work. To adjust salaries to reflect cost of living we made use of Numbeo, which factors in rent, groceries, fuel, taxes and more.